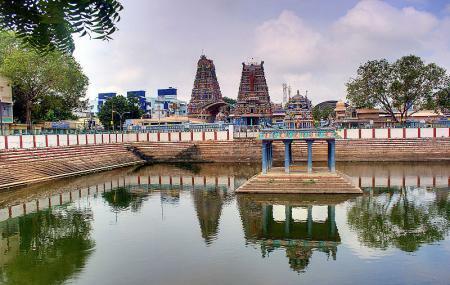 Perched in Chennai’s neighbourhood of Vadapalani, which is famous for its film sets, the Vadapalani Murugan Temple is one of the most significant places of pilgrimage in India. Dedicated to Lord Muruga or the Karthikeya, which is the Hindu God of war, this temple is becoming more popular owing to its patronage of cinema stars. The temples beauty lies in the fact that it was built more than a century ago, with its intricate carvings still remaining very intact. The grounds of this temples are considered auspicious for good beginnings. Thus, there are some 7000-odd marriages that take place here annually. The festival of Chithirai Tamil New Year is one of the many festivals that is celebrated on a very large scale here. It takes place mostly in the month of April. Also, visit the popular attractions in the city by following Chennai itinerary 1 day. How popular is Vadapalani Murugan Temple? People normally club together St. Thomas Mount National Shrine and Chennai Central while planning their visit to Vadapalani Murugan Temple. It’s a great temple to visit.! There are two to three facilities to climb up the mountain. There is rope car and you can walk. There is rope train too. I have heard it . Prasad is something you get right outside the temple, near the terrace. You have to pay 💰 more money to sit in front of good which happens at evenings of few days of a week. There is parking lot down. There are two to three entrances for this temple. Apart from this, when you climb up, there are so many shops on the climbing path. It’s fun to climb up and climb down if the weather is not sunny. Keep your slippers in car is another advice I want to provide. This temple is famous for Lord Murugan. Timings: 5:00 AM - 12:00 PM & 4:00 PM - 9:00 PM Entry Fee: No entry fee. It is also believed that worshipping Lord Murugan here is as pious as praying to him at the original Palani temple. If someone is unable to visit the original abode, they can pay their respects here, and Murugan will bless them all the same. Vadapalani Murugan Temple has a rich history and an ornate architecture and is also enriched with people's faiths from all-over the country. A very good place for Murugan Devotees.., first of all I want to thank the workers and Temple devasthanam for keeping the temple very clean.., Come and Forget all your problems and pray LORD MURUGAN in peace mind. I sure that definitely you will feel the change/get relax / get peaceful mind in you. I love to go once in a week. In this temple there a lot of god and goddess were there. It's a small temple if you ask me. Okay good place to visit. Just have a look, pray and ciao. Nothing much to do there. Just observe the architecture and you'll be on your way to the next destination. The aiyaar can be rude, so keep your phones close to you when taking pictures. Almost got my phone confiscated. I To fulfill Religious vow. Nice place. Crowd due to Marriage done at temple.